Imhappynow.com is a huge success, as signified by Diarmuid’s upcoming radio interviews and global audience. I asked him to give a brief introduction to the book. How long was it in the works? How did it begin? “This book is a very different move for me,” Diarmuid says, “I had just finished another book called When Leaves are Falling, which was a historical fiction novel and was already half way through a World War I book when the idea for this one came into my head. I couldn’t seem to get rid of it so I stopped what I was at and started ImHappyNow.com. I had it sitting on the shelf for a year before I decided I better start doing something about it. 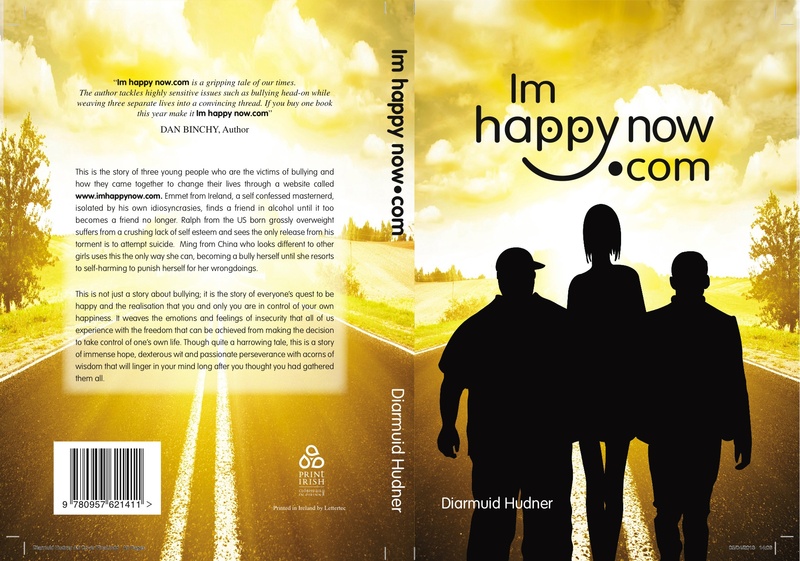 I asked Diamuid what he enjoyed writing the most in Imhappynow.com and why: “I enjoyed the self reflection that was needed in order to write this type of book which was difficult in its own way. I had to question myself alot about how I was living my life and the level of happiness I had or hoped to have. It deals with some very raw issues such as bullying, alcoholism, suicide and self harming so it was traumatic in its own way. It’s actually a very simple message that you and only you are in charge of your own happiness. “I was Chairman of the Doneraile Literary & Arts Festival and I was running some workshops and began talking to more and more people who had gone down the self-publishing route. I have learned from my days in business that the market always decides and self-publishing has arisen from the traditional publishing world becoming a very closed sector. I looked at the statistics and weighed everything up before I decided to go down this route. It was daunting as I had two offers from publishers to publish my book but decided to self publish anyway as I felt I was more in control. Twenty percent of the top ten bestsellers last year were self published so it has established itself in its own right. I asked Diarmuid how he found the finished product from Selfpublishbooks.ie – was it as he had imagined? Veronica Sweeney has been a published novelist for twenty-eight years. She wrote her trilogy, The Emancipist, after nine and a half years of research. It was first published in one volume by Pan MacMillan in 1985 and reprinted consistently for twenty years by publishing houses such as Century Hutchinson, Simon & Schuster, Avon Books, Bantam and HarperCollins. It is now being printed by Selfpublishbooks.ie as a trilogy. Veronica is an established novelist with an international reputation, but when she recently made the switch from traditional publishing to self-publishing, she knew she was taking a risk. “But I needn’t have worried,” she said, “It’s been fun … and – I can’t stress this enough – to be able to choose my own covers and design after twenty-eight years as a professional novelist has been the best part.” Lettertec, the printing press in County Cork with a self-publishing imprint Selfpublishbooks.ie, is producing The Emancipist in three separate volumes this year. I ask Veronica how self-publishing caught her eye: “Amazon Kindle first of all – it’s levelled the playing field for writers at last. We’re back to the early days of the printing press, like Erasmus! Get a good idea and take it to the printer – before publishers and agents became involved! “The whole process was very speedy,” she adds, “I think it took about two weeks, and that was mostly me being very fussy about the cover. Book One of The Emancipist – titled The Big House – is available now. Books Two and Three will be available in early December, ready for Christmas. The late Gore Vidal said, characteristically: “Style is knowing who you are, what you want to say, and not giving a damn.” So is there something that risks being damned, in style? Something about bravado, defiance, the defiance that rings of individuality? Is there a sense, too, in which some writers use style as a marker of existence? A proof we’re here? But good working style is powerful whether it’s bullish or showy or quiet. Style’s existence is a matter of verbal precision, nothing else. Fight, fight, fight. Language is never not up for it. It’s a fight to the life. All we need to do, reader or writer, from first line to final page, is be as open as a book, and be alive to the life in language – on all its levels. Then style, as usual, will do what it does best. Then you, and I, and all of us (all seven billion of us here now in the world, not forgetting all the people in the future, and the past) with all our individualities, all our struggles, all our means of expression, will find ourselves, one way and another, when it comes to the novel, content. The Guardian is offering daily updates on the Edinburgh Book Festival — have a look at them all here.